Happy Friday! Fashion Friday!! 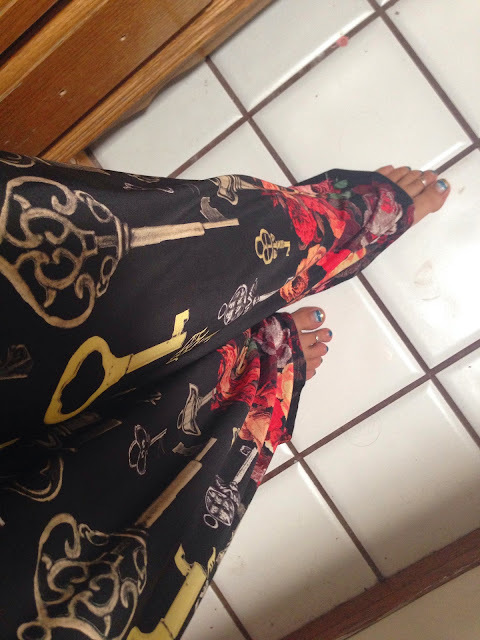 I'm a girl who loves her fashion. 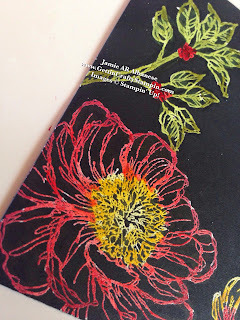 I love how fashion and paper crafting have so much in common and I love highlighting their connection on my Fashion Friday Posts. 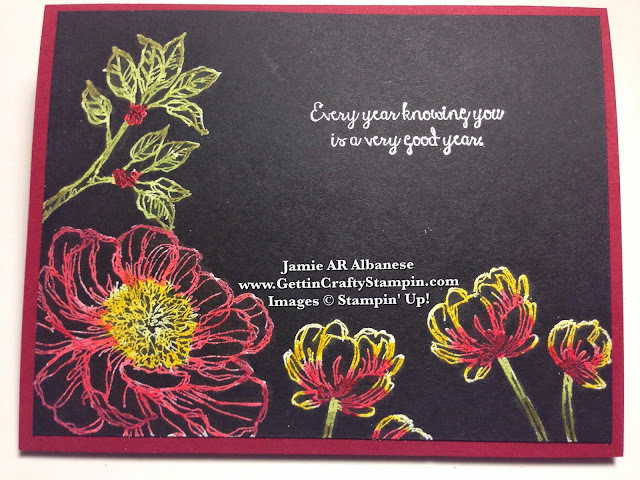 This stunning colorful blossom card on a dark black background is one that will light up the lives of all who see it. 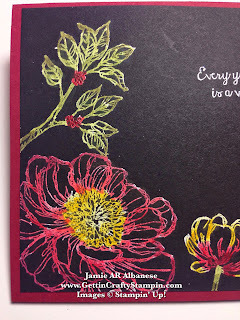 See this fun and easy tutorial on creating a pop of color on a dark background in paper crafting. Like and Share this with your family and friends. 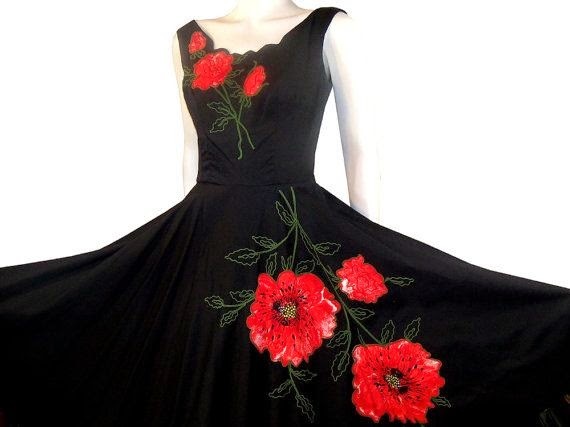 A stunning 50's dress that I'd so wear!! I could so see this as a dancing dress... to a fun fiesta or margarita party... or just because it's so pretty! See why it inspired this hand-crafted card. I like the look so much that my pants even sport a similar look. See, I told you I love fashion. This technique is surprisingly easy and fun. I'm delighted when I use this technique as the colors really POP and wow. 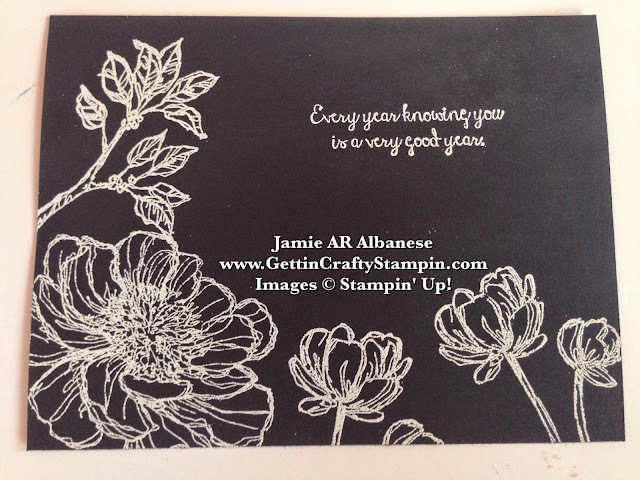 ~ Prepare the surface of the Basic Black card stock (cut to 4"x 5-1/4") by rubbing the surface of the card stock with the Embossing Buddy. ~ Stamp this stunning collection of nature and sentiment from the Bloom with Hope Hostess Exclusive stamp set using the Versa Mark ink pad. ~ Cover with the White Stampin' Embossing Powder. ~ Heat Set with the Heat Tool and BAM - you have a stunning image of white flowers and leaves. ~This would be great for a Chalkboard like look to a card... but take it up a notch with our Blendablilties Markers. STUNNING COLOR!! I feel like that cute kid from the Despicable Me movie - lol. I love color and how this looks!! Take a class with me and play with cool colorful paper-crafting techniques like this! Leaving dashes of white will allow the colors to pop and highlight on this hand-colored card. 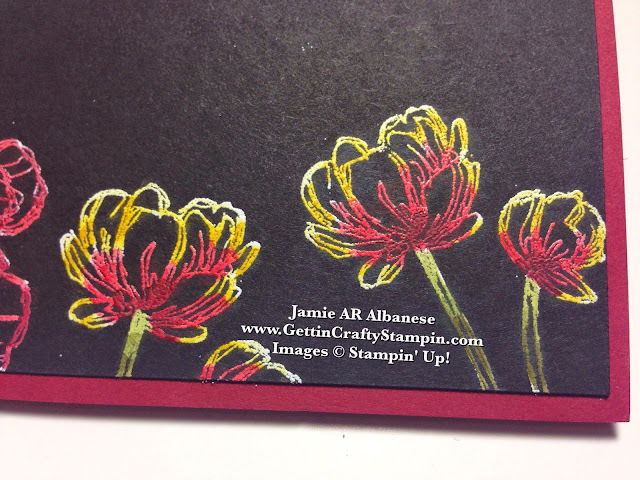 See how the Colors POP when you lay it on the Cherry Cobbler card base and that color really pops! I LOVE our Blendabilites Markers! CLICK HERE to see a collection of projects using this coloring system. See this Ombre Video Coloring Technique with the Blendablities Markers - it is the technique I used in coloring this hand-crafted card. Up close you can see the loose coloring - it's on a Black background so if you mis-color and color off of the lines - no one will see it! I love how the Cherry Cobbler and Daffodil Delight with the Old Olive are all ideally paired for a great look. I love how our card stocks, inks, markers, accessories and more are all coordinated to match and make your projects look amazing. Create and send a WOW card full of bold colors using this cool technique. No matter where you find your inspiration, from fashion to nature, try something new and wow with your style. I hope that this fun Fashion Friday blesses you and makes you smile, like it does me. Find fun inspiration and CREATE!! 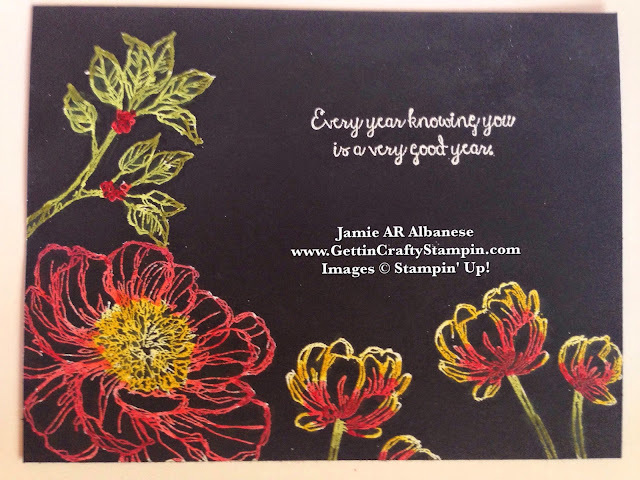 A hand-stamped card is a great way to deliver smiles.